Seattle, WA, then San Francisco, CA. Publisher: Lotus Publishing Company. Editor: Jerome A. Anderson. 1/1, November 1891-1898. $1.00 a year, 16 pp. 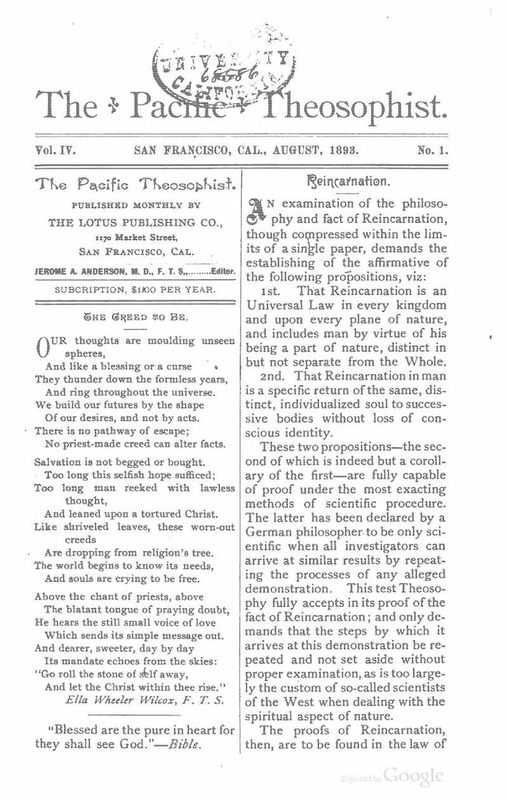 Anderson also edited and was a founder of the New Californian and seems to have taken this journal over, moving it to San Francisco, when the New Californian was relocated to Los Angeles. The two journals combined were said to have had a circulation of 30,000, but this journal notes that it was printing only 1000 copies and distributing half of those gratis. In the internecine squabbles within the Theosophical Society after the deaths of H.P. Blavatsky and W.Q. Judge, the journal followed Judge and then Katherine A. Tingley. Contributions by Countess Wachtmeister, Judge, Tingley, et al., regular comments on the events of the upheaval in the Theosophical Society, and brief lodge notes on the activities of the society on the West Coast. The table of contents for this, prepared by the Australian Theosophical Society, is now online at http://www.austheos.org.